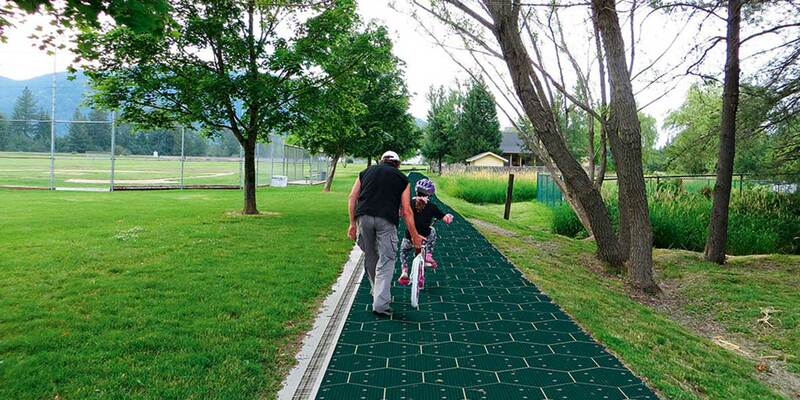 Solar Roadways® (SR) is a modular system of specially engineered solar panels that can be walked and driven upon. Our panels contain LED lights to create lines and signage without paint. They contain heating elements to prevent snow and ice accumulation. 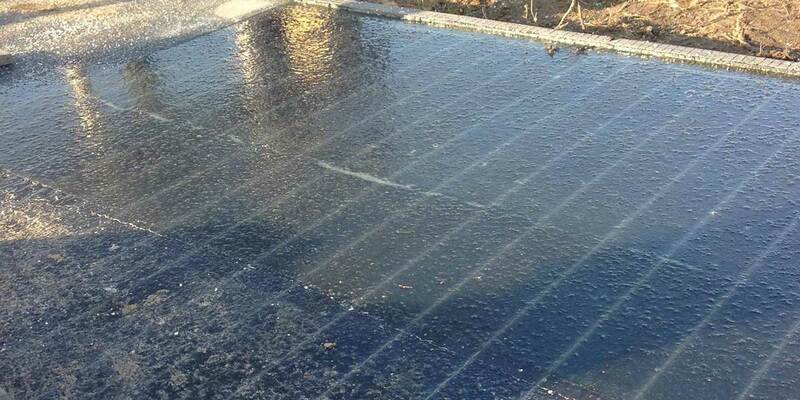 The panels of Solar Roadways have microprocessors, which makes them intelligent. This allows the panels to communicate with each other, a central control station, and vehicles. Many people are surprised to learn that our panels are made of glass… but not ordinary glass. SR panels are made of specifically formulated tempered glass, which can support the weight of semi-trucks. The glass has a tractioned surface which is equivalent to asphalt. You can read more technical information in the Specifics page. We’re still in an early phase of our company’s development. Eventually our panels will be available for highways, but first will come non-critical applications such as driveways and parking lots. We are readying to install the first projects now. Earlier this week, the first solar roadway opened in Amsterdam — a 70-meter stretch of cycle path between two suburbs of the city that generates solar power from rugged, textured glass-covered photovoltaic cells. My significant other, Jessica Hall, happens to be spending a semester in Amsterdam and was willing to trek out to the Krommenie-Wormerveer cross-connection to see this solar roadway in action. Below, we’ll answer some common questions people have raised about the projects and the road itself. One thing to know about the Netherlands is that biking is huge there, despite the wet, maritime climate. Building a solar bike path isn’t a throwaway gesture as it is in the United States, and the bike path itself, as you’ll see, is laned like a modern road. This project is built by SolaRoad — it’s different from the crowdfunded Solar Roadways project that we wrote about earlier this year. At present, only 70 meters of a planned 100 meters has been completed and only one side. This stretch of path is bathed in consistent sunlight for most of the day, making it a good test case for the project. 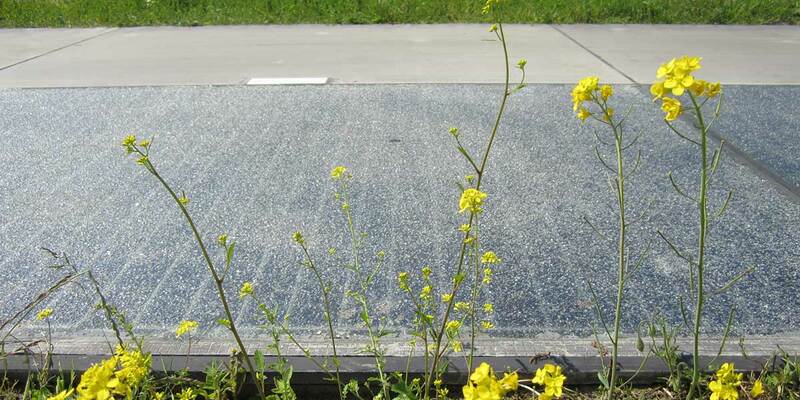 In the image above, the solar road is on the left, the traditional concrete is on the right. 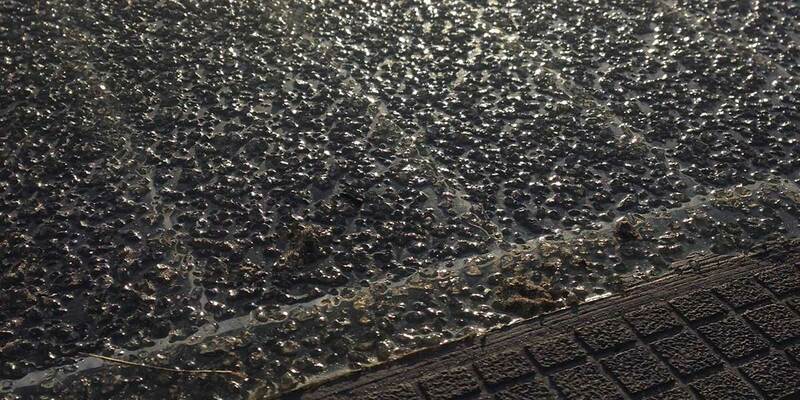 One of the questions readers have raised is what traction could be like on a solar roadbed. According to Jess, the road is heavily textured and bumpy to the point that she’d be less afraid of wiping out on concrete than on the solar section. The difference is clearly visible even while standing. Here’s the closeup version. The solar road and the standard concrete were the same temperature, but that doesn’t necessarily tell us much — it was cloudy early in the day when these photos were taken, and the sun hadn’t been out very long that afternoon. The solar surface is embedded below the glass/epoxy outer layer. With texturing like that, you’d expect the surface to grip well — and it does. It’s effectively impossible to slip on the surface. Amsterdam has a maritime climate, which means it rains frequently in winter but snow is less common and heavy snowfall is rare. (Your definition of what constitutes heavy snowfall will depend on where you live, obviously). One interesting question readers had raised is whether or not these new roads are more reflective than previous surfaces. They definitely are — though whether this will be a problem for riders is unclear. You can clearly see reflections in the road surface, and these are visible (albeit less clearly) even in the cloudier photos. 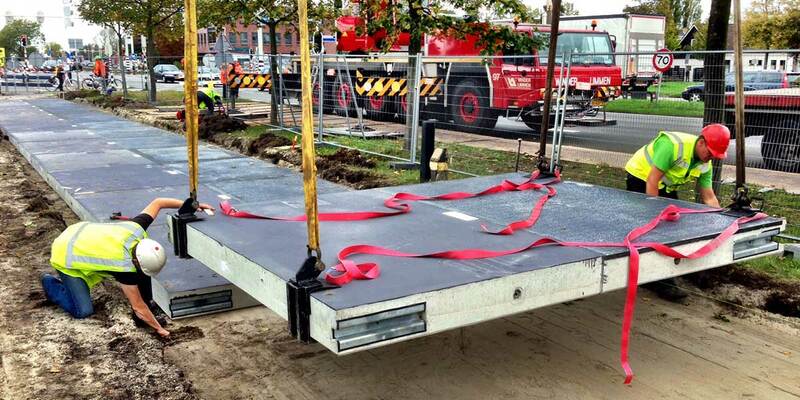 One reason installing these solar panels on a bike path makes more sense than a traditional road is the wear-and-tear expected on the road itself. According to studies, one reasonable method of estimating road wear is the so-called fourth-power law, which states that the damage a vehicle causes to a road surface is related to the fourth power of its axle weight. Speed and tire pressure all play a part, but the end result is that cars are at least several thousand times more damaging to a road surface than bikes, and trucks are thousands of times more damaging than cars. 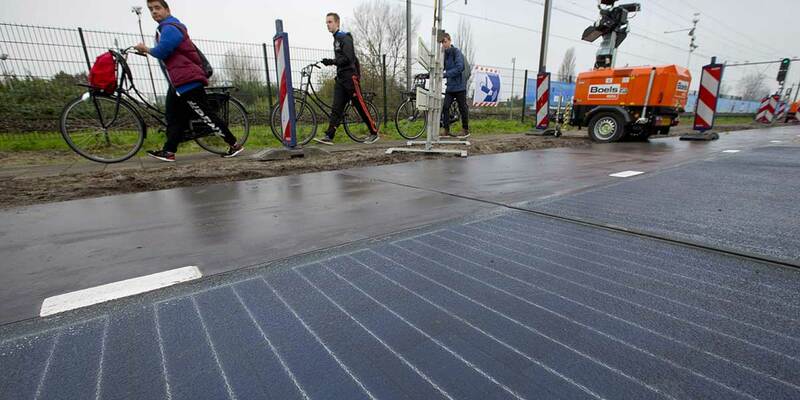 A solar road surface for a bike path is thus under orders of magnitude less stress than a vehicular road surface. For now, the entire project is a proof-of-concept demonstration. Plenty of people who are otherwise enthusiastic proponents of solar power are dubious of embedding panels into roadways, and we’ll have to wait and see how this solution performs under real-world conditions to draw conclusions. Nonetheless, it’s impossible to draw conclusions until someone does the testing — so kudos to Amsterdam (and Jess Hall) for taking the plunge on an idea and serving as remote photojournalist, respectively. 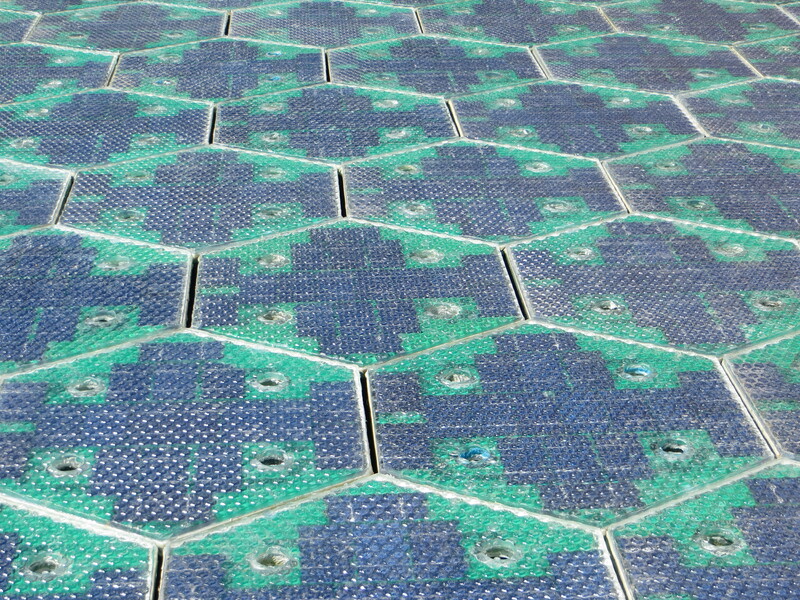 There are some additional photos of the solar roadway available on Imgur. In West-Frankrijk is donderdag de eerste openbare weg met zonnepanelen geopend voor gemotoriseerde voertuigen. De zonnepanelen moeten genoeg stroom opleveren voor de straatverlichting in het dorp Tourouvre-au-Perche. Het aanleggen van de weg heeft vijf miljoen euro gekost. Op de plaatselijke weg rijden zo’n tweeduizend auto’s per dag. De Franse regering wil het project twee jaar testen om te kijken of de weg rendabel is. Het is nog niet zeker of met de weg genoeg energie kan worden opgewekt voor de openbare verlichting in het dorp met 3.400 inwoners, ten westen van Parijs. In Nederland werd in 2014 de eerste weg met zonnepanelen geopend. Het fietspad in Krommenie levert genoeg energie om een huis van een gemiddeld gezin van stroom te voorzien.